The online version of this article ( https://doi.org/10.1186/s13041-019-0441-8) contains supplementary material, which is available to authorized users. Behavioural flexibility is a key cognitive ability required for effectively addressing the demands of a constantly changing environment. The mGluR5 subtype of metabotropic glutamate receptors is involved in this cognitive function [1, 2, 3, 4]. The studies characterizing this relationship have assessed rodents in which mGluR5 receptor expression or function has been manipulated with genetic or pharmacological tools in reversal learning or extinction paradigms. Notably, their behaviours were measured in every study under high stress conditions, for example, using classical (Pavlovian) fear conditioning or water maze escape paradigms [1, 2, 3, 4, 5]. Exposure to aversive stimuli such as foot shock and forced swim can induce stress responses that affect learning, planning [6, 7, 8, 9, 10] and reward responsiveness [11, 12], making it difficult for paradigms that use aversive stimuli to discriminate between stress susceptibility and cognitive rigidity. This is particularly important in studies of mGluR5, because mGluR5 is critical in resilience and the responses of mice to stressful stimuli [13, 14]. 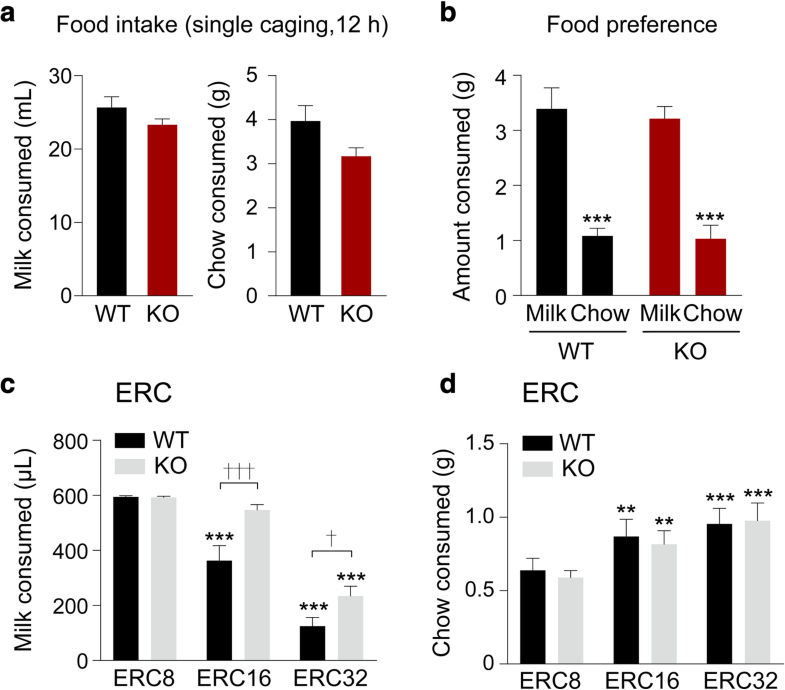 An mGluR5-dependent impact on overall affective state could, therefore, contribute indirectly to any observed change in behavioural flexibility. We hence wanted to assess the effects of mGluR5 manipulation on cognitive flexibility in a relatively low-stress operant context to provide further insight into the role this receptor plays in this process. To do this, we evaluated the cognitive flexibility of mGluR5 KO and WT littermates using a rodent touchscreen cognitive assessment apparatus [15, 16]. This platform exclusively uses appetitive reinforcement to avoid stress-related confounding effects. Animals are assessed in sound-attenuated, darkened behavioural chambers to which they are thoroughly habituated. This system is also automated such that the experimenter does not handle the animals during testing, thus minimizing the stress associated with experimenter-animal interactions. The use of computerized task delivery, data recording, and analysis also ensures full standardization between chambers, as well as robust paradigm stability between sessions and the elimination of experimenter/scorer bias within and across studies [16, 17, 18, 19, 20]. These attributes contribute to high data reproducibility that enables direct comparisons of studies both within and between research groups [19, 21]. mGluR5 is ubiquitously expressed across several key brain areas, such as the hippocampus, nucleus accumbens, dorsal striatum, and cerebral cortex [36, 37]. It also plays a critical role in various forms of synaptic plasticity [1, 22, 38, 39, 40]. 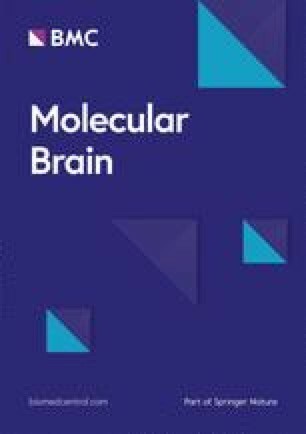 These characteristics have suggested mGluR5 as an important therapeutic target for the treatment of various neuropsychiatric and neurodegenerative disorders [41, 42, 43], with the potential for alleviating problems associated with disruptions across a number of important cognitive domains. One such cognitive domain is behavioural flexibility, which is critical to the success of an organism exposed to a changing environment and its associated alterations in stimulus-reward associations. Response inhibition is a key process required for effective behavioural flexibility, and a variety of studies have reported impairments in response inhibition in mice deficient in mGluR5 either because of a genetic deletion or because of pharmacological antagonism [1, 2, 3, 4, 5]. However, most of the studies that have implicated mGluR5 in behavioural flexibility have assessed genetically or pharmacologically manipulated animals under high stress conditions, for example using classical (Pavlovian) fear conditioning or shock avoidance paradigms and forced swim paradigms [1, 2, 3, 4, 5]. As stress-exposure typically affects cognition adversely (although sometimes facilitates cognitive functions) [6, 7, 8, 9, 10], it is challenging to separate the effect of a manipulation on behavioural flexibility from its effects on global affective state under high stress conditions. Indeed, this is of particular significance because of mGluR5’s critical role in resilience and in the responses of animals to stressful stimuli [13, 14]. To overcome this limitation, here we leveraged the benefits of the rodent touchscreen cognitive assessment apparatus [16, 18, 20] to evaluate behavioural flexibility in the mGluR5 KO mouse model under low stress conditions using a battery of appetitive reinforced behavioural tasks. The ratio schedule we used here was designed to study motivation [23, 32, 45]. The canonical interpretation of elevated breakpoints is increased motivation. 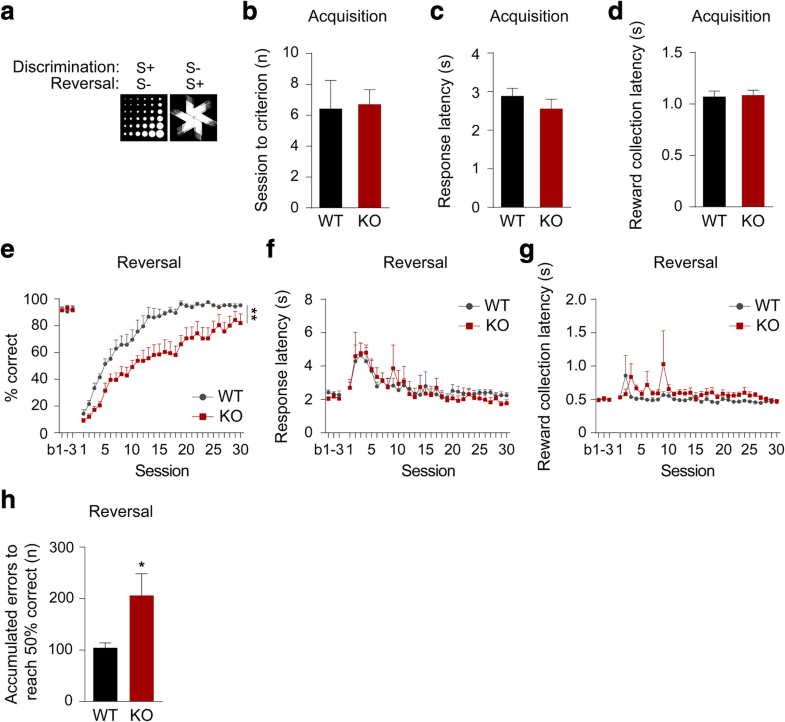 Thus, the higher breakpoints achieved by mGluR5 KO mice indicate that their deficits in reversal learning and EXT are unlikely due to a lack of motivation. Moreover, several studies have shown that PR breakpoints are sensitive to perseveration [33, 34, 35]. 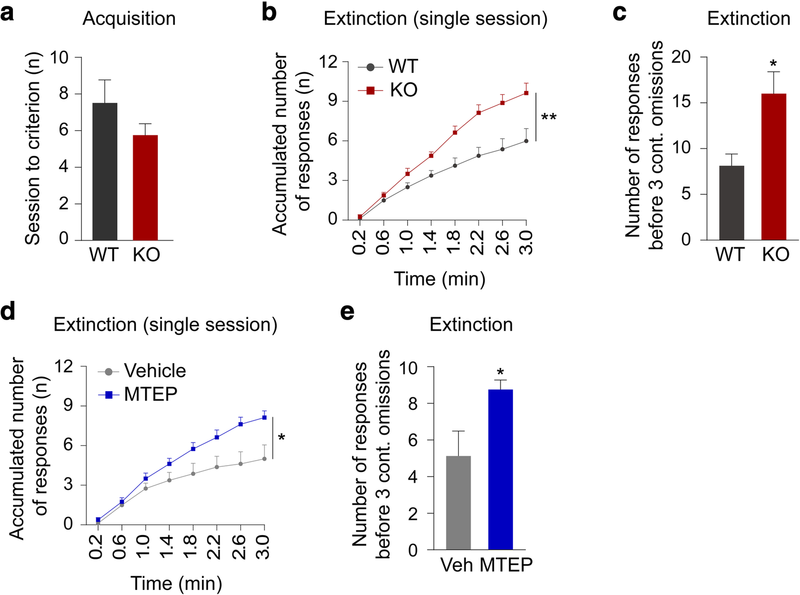 The careful analysis we performed in this study revealed that the high PR breakpoints we observed for the mGluR5 KO mice were due to perseveration. Interestingly, the elevated performance we observed in these ratio schedule tasks conflicts with studies of food-maintained PR performance in rats acutely administered with the mGluR5 antagonists MPEP and MTEP. These compounds cause either a suppression in performance or no effect [46, 47, 48]. These differences may be attributable to species differences, differences in the details of the behavioural assessment paradigm, or differences in the mGluR5 manipulation approach producing off-target/side-effects. Here we have assessed the role of mGluR5 in behavioural flexibility in a low stress, appetitively reinforced context using tasks delivered via the rodent touchscreen assessment system. We found that mGluR5 KO mice have deficits in behavioural flexibility that are manifested as an impaired capacity to reverse in a two-choice VDR assay and an impaired capacity to extinguish a previously acquired operant response. The impaired behavioral flexibility of mGluR5 KO mice is driven by perseverative behavior. Because perseveration occurs in several disease states (i.e., epilepsy, dementia, schizophrenia, and stroke), patients suffering from these diseases may benefit from pharmacological modulation of mGluR5 activity. This is all the more promising because a positive allosteric modulator of mGluR5 was found to reduce perseverative behavior in a schizophrenia mouse model . Several brain regions including the orbitofrontal cortex, infralimbic cortex and amygdala are thought to be responsible for behavioural flexibility in humans and rodents [51, 52, 53, 54]. 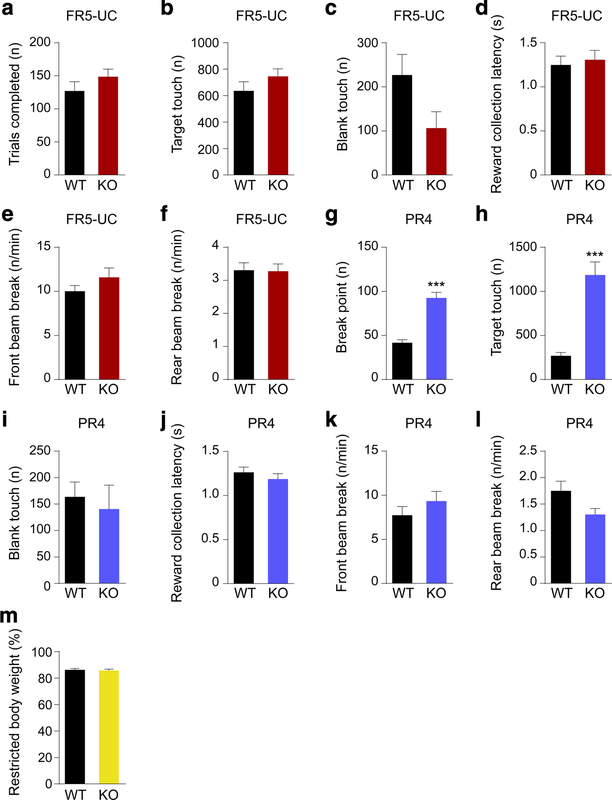 Here, the deficits in mGluR5 KO flexibility can be attributed to high levels of perseverative responding, which have often been associated with orbitofrontal dysfunction [53, 55, 56, 57, 58]. 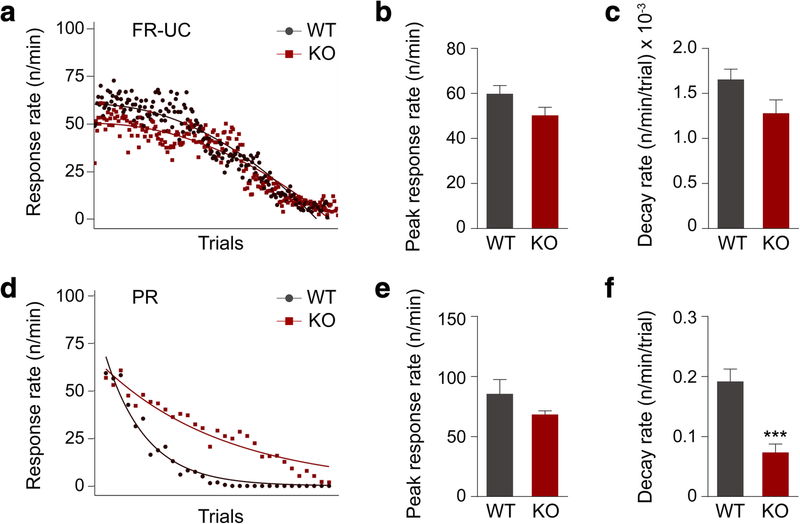 Further studies will help clarify how mGluR5 regulates perseverative responding, which regions of the brain are involved, and how behavioural flexibility can be normalized in mGluR5-deficient brains.